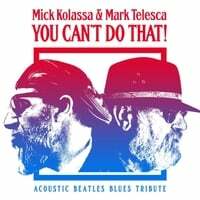 Mick Kolassa and Mark Telesca Have teamed up to bring two mutual loves together: the Blues and the Beatles. This album is the kind of thing that happens when two musicians get together and decide to make some magic. They called the album “You Can’t Do That,” which refers to a great song that has the blues all over it as well as what many people told them when they said we were going to do the record! For many, including Mick and Mark, this music is nearly sacred, but as blues artists they find and feel the blues in everything they hear, and the blues flows through the music of the Beatles more so than it does through other forms of popular music, so uncovering it was not too difficult – but oh so pleasurable! Jeff Jensen joined the team to produce the album and together with Mick and Mark put together some pretty fancy guitar work, and with a little help from their friends the guys got this project off the ground – way off the ground! Reworking these classic tunes into blues arrangements was a joy for the artists, who brought the Beatles into many different styles of blues – but always with acoustic arrangements, no amplifiers or pedals were used in the production of this album! Instead you’ll find resonator and multiple acoustic guitars, harmonica, trumpets, flugelhorns and even a fiddle and mandolin. Never forget, all you need is blues!